Run InjuredPixels without installation, and check any LCD monitor or tablet for dead pixels or defects. Even in the store. Test a screen during the warranty period, as you may get a replacement according to the manufacturer's dead pixel policy. Easily check for hot, dead or stuck pixels, for pixels that do not illuminate properly or do not display the correct color output. InjuredPixels fills the entire screen with a single color, so you can check for pixels that do not match the selected color. 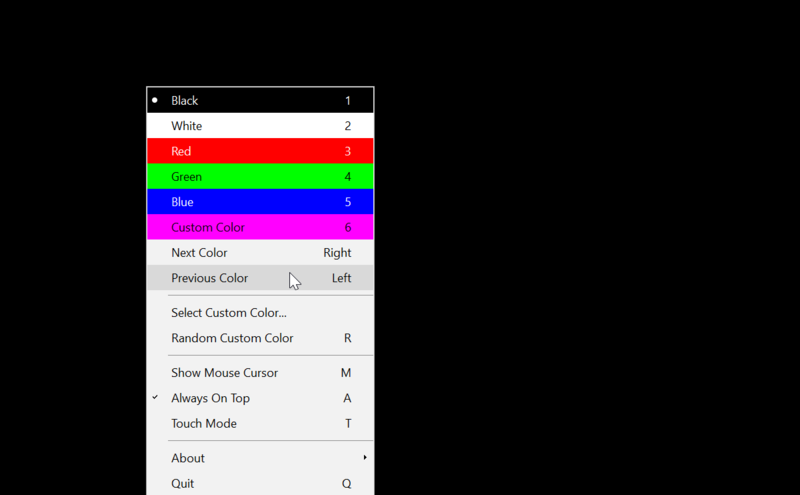 Just click or use the arrow keys to cycle through the test colors, or right-click to get the menu with the main commands. InjuredPixels has built-in multi-monitor support, so you can check all connected monitors for dead or defective pixels. As hardware diagnostics applications go, InjuredPixels is just about as simple a program as you'll see. This solution has no rival in the simplicity department. Software tools simply don't come any simpler than InjuredPixels. Verdict: A simple and convenient tool which makes it much easier to locate dead pixels on an LCD display.